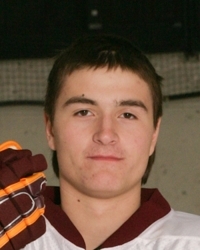 Northfield's 8-13-0 record heading into this week won't impress many in boys' hockey circles. But the Raiders' 4-3 victory over Class 1A, Section 1 rival Mankato West (14-7-3) last weekend should at least give the team some bragging rights in the seeding meeting. It might even offer a boost for the regular season stretch run. As he's done all season, sophomore Andrew Scofield was the driving force against the Scarlets. Scofield, a forward, netted a hat trick in the come-from-behind victory. He also assisted on senior Charlie Cloud's first period goal, which came with just five seconds remaining. "He is our offense," Raiders coach Bryce Barry said of Scofield, who has scored 30 points this season. "Even though teams try and shut him down, he's been able to score or have impacts on the scoreboard in other ways." In assisting on Cloud's goal, Scofield fended off three defenders to make the pass. Scofield's 5-10, 175-pound frame is a nice complement to his steady hands, Barry said. "He needs to get a little bit faster," Barry said. "But the kid has hockey-sense eyes and is a goal scorer. He'll come off the mid-boards and power his way into the slot and rip off a shot.